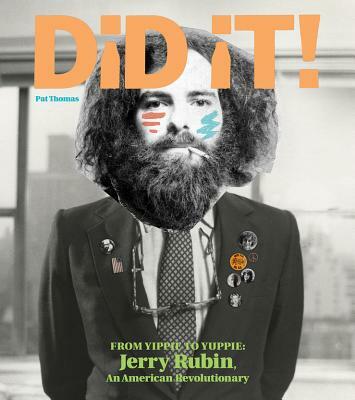 Did It From Yippie to Yuppie: Jerry Rubin, an American Revolutionary is an oversized oral & visual history of the infamous and ubiquitous Rubin - the first ever biography of the co-founder of the Yippies, Anti-Vietnam War radical, Chicago 8 defendant, New Age/Self Help proponent, and social-networking pioneer. After a surfeit of books about Abbie Hoffman, here's the first ever biography of his Yippie running mate Jerry Rubin Based upon over 75 original interviews with his co-conspirators, friends and foes, this book not only explores the life and times of Rubin, but the generation that consisted of idealistic firebrands in the 1960s, segued into the Me generation in the 1970s, and became full blown capitalists engaged in the 1980s. Those interviewed include fellow Chicago 8 Defendants, participants in the Berkeley Free Speech Movement; Paul Krassner, Judy Gumbo, Nancy Kurshan, John & Leni Sinclair, Bobby Seale, Rennie Davis, Lee Weiner, Country Joe McDonald and dozens more reveal, in their own words, vibrant stories of the era. Often left out in histories of the radical sixties, twenty women speak out in their own voice Also chronicled is the 1970's New Age Movement with commentary from Stella Resnick, Werner Erhard, Mimi Leonard and others. Bizarre interactions with luminaries including Allen Ginsberg, Bob Dylan, Timothy Leary, and John Lennon are described via interviews and diaries (found in Rubin's personal archives and published here for the first time) along with photographs and correspondence with Norman Mailer, Eldridge Cleaver, Mayor Daley and the Weathermen. Also explored is the oft-misunderstood relationship between Rubin and his partner-in-crime Abbie Hoffman with controversial insights into their Yippie vs. Yuppie debates.